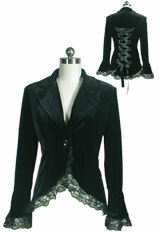 This punk velvet jacket is lace trimming of the hem and cuff, one button closure front, corset tie back, flare cuffs, high quality soft velvet, fully lined. Standard size approx. length: 27 inches; Plus size approx. length: 29.5 inches.